Her adventure that evening began as Ararat Home COO Derik G. Ghookasian, Ararat-Eskijian Museum Director Maggie Goschin, Grandma and I maneuvered through the streets of Century City trying to make our way to the Century Plaza hotel, a seemingly impossible feat with all the road closures due to the presidential arrival. Grandma, not getting out much in the last decade or so, took in all the sights in an almost gleeful child-like fashion, commenting on the height and architecture of the buildings, the beautiful trees lining the streets and the futuristic looking public buses…like a child in a candy store admiring all the treats being offered. We were on our way to the 20th anniversary gala for the Shoah Institute for Visual History and Education. 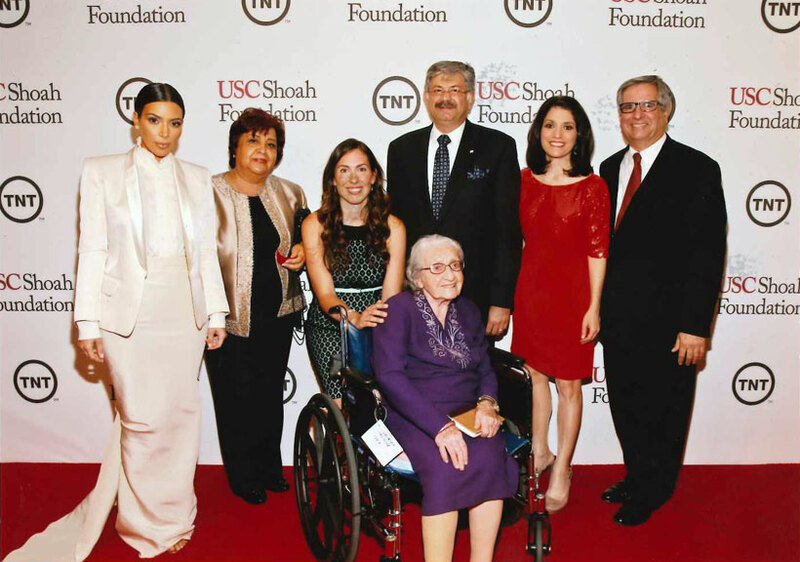 Shoah, founded by Spielberg, documents audiovisual interviews with survivors and witnesses of the Holocaust and other genocides and had recently interviewed Grandma for their video archives and subsequently invited her as an honored guest. We finally arrived at the hotel and were greeted warmly at the lobby entrance by Dr. Stephen Smith, Executive Director of Shoah, and were guided through the crowds by their lovely Director of Development, Sylvia Moskovitz, who welcomed Grandma, hugging her and holding back tears while telling her how honored Shoah was to have Grandma attend the event. Grandma was clearly labeled a VIP, as we were hurried past all the lines, bypassed the metal detectors, and waived in by the Secret Service, who didn’t even ask to see our IDs. As our names were checked off the list by Secret Service, lo and behold, one very famous Kim Kardashian approached. Kim immediately greeted Grandma and gave her phone to the security guard to take a picture of the two of them…a picture now made famous by her post on Instagram with the heading, “I’m sitting next to the most inspiring 100 year-old Armenian genocide survivor”; a picture “liked” by over 380,000 people in less than 24 hours. Kim then took professional pictures with us and separately with Grandma in front of the step and repeat backdrop. The Shoah staff then took us to a comfortable lounge, which was much quieter than the hubbub of the main reception area, but Grandma would have none of it requesting instead to go out into the crowd, at one point even wheeling herself away in her wheelchair to get closer to the action. Surrounded by Prada and Louis Vitton, Grandma wore her now “vintage” royal purple crepe dress, sewn lovingly by my husband’s grandmother, Maritza Fustukjian, over 50 years ago. Grandma has worn this dress at most every special occasion in her life over the last five decades, including her grandchildren’s weddings, her 100th birthday party, and now this star-studded gala. It was indeed a grand affair with 1100+ sharp-looking attendees, red carpet lining the ground, and camera flashes everywhere. I’m not sure if Grandma realized she was surrounded by some of the most famous and influential people in America, with President Obama, Steven Spielberg, Liam Neeson, Conan O’Brien, Bruce Springsteen, Samuel Jackson and Barbara Streisand speaking, performing and in attendance. In Armenian, there is a saying, “Oordeghen oor,” loosely translated meaning, “Look at where we were…and look at where we are.” Indeed, the setting Grandma found herself in at the gala was a far cry from the massacre ridden streets of Aintab, Turkey, or the refugee camps to which her family fled in Aleppo, Syria. From Aleppo, they fled to Damascus, Syria, to escape yet another wave of massacres, and then from Damascus again to Beirut, Lebanon. Eventually they fled even Beirut in the midst of civil war and finally settled in the United States. Fast forwarding now to the 21st century on the night of the gala, we entered the grand ballroom after the reception and were seated with some lovely Armenians who had traveled all the way from the East Coast for the event, one of whom I found out was Grandma’s great niece and my second cousin, Melanie Dadourian (the granddaughter of Grandma’s husband’s sister, Elise Salibian). 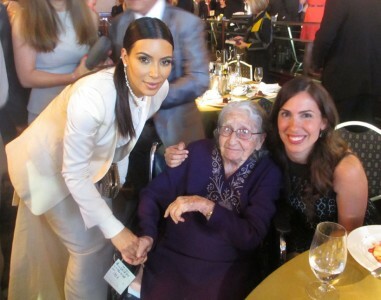 The table was all but full when Kim Kardashian was ushered to our table and was seated right next to Grandma and me. Grandma was probably the only person in the room who was oblivious to Kim’s fame, asking me who she was. When I introduced Grandma to Kim, I told her “This is Kim Kardashian, one of the most famous Armenian women in the world.” True to form, Grandma proceeded to talk to Kim about God. Kim looked elegant and was gracious to take pictures with all those who asked…and there were many who did. Interestingly, however, there was one person at our table more popular than Kim that evening …and that was little Grandma Yevnige in her wheelchair. 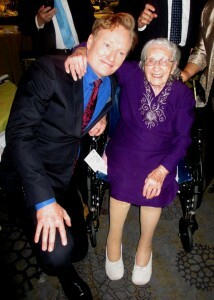 I’m sure it’s rare for Kim to be upstaged by anyone, but on this special night, Grandma was the star. Dozens of people, including Congressional candidate Nancy Najarian, came up to us over the course of the evening asking to take pictures with Grandma, stating how honored they were to meet her, and seeking to speak to the woman I’ve come to know as my amazing and faith-filled Grandma. Several walked away teary-eyed telling me how lucky I am to have her in my life and asking if I’ve heard her share her stories. 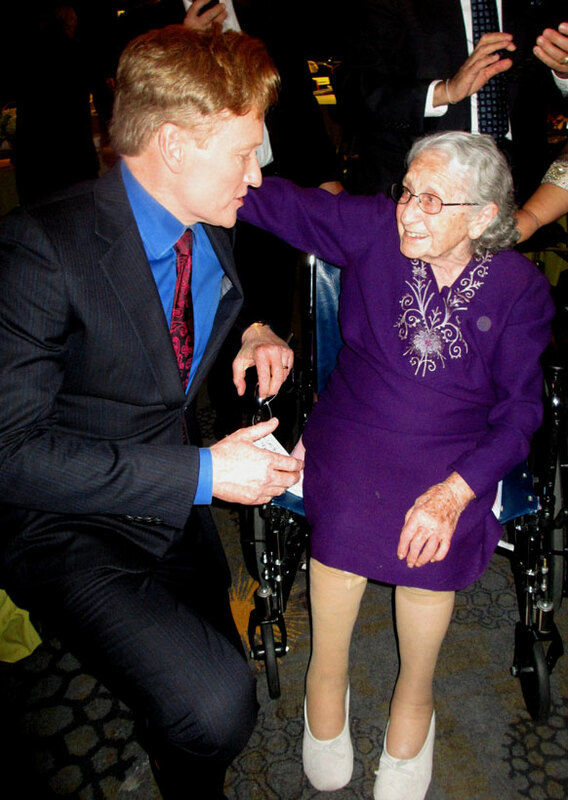 Her family members and I have indeed been blessed to sit by her side and hear so many of her stories of faith and survival. This night made me realize that I have taken that for granted. 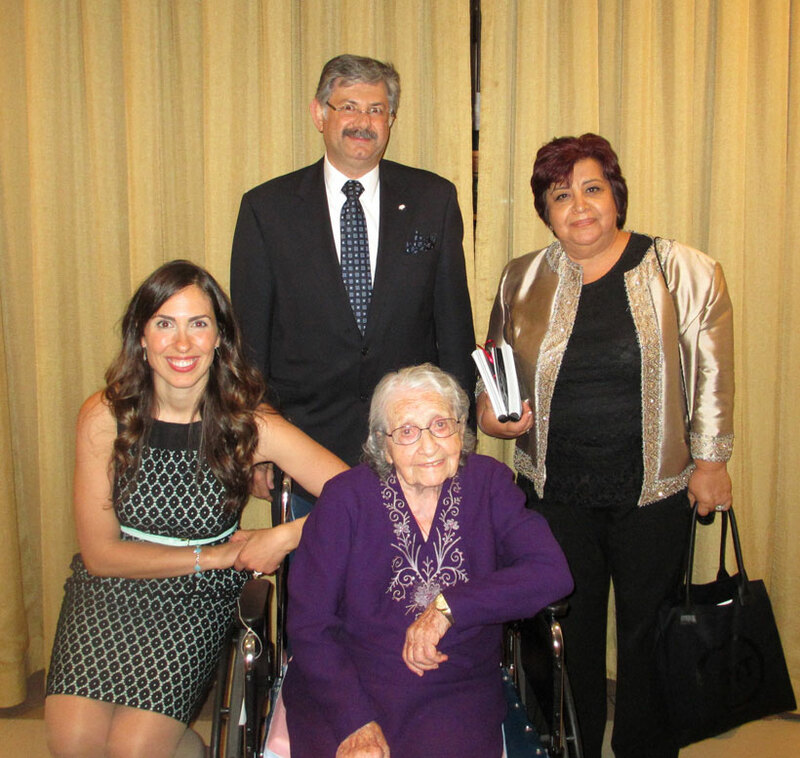 The program honored Grandma and other survivors and highlighted the work Shoah is doing to keep the eyewitness testimonies of their stories alive. 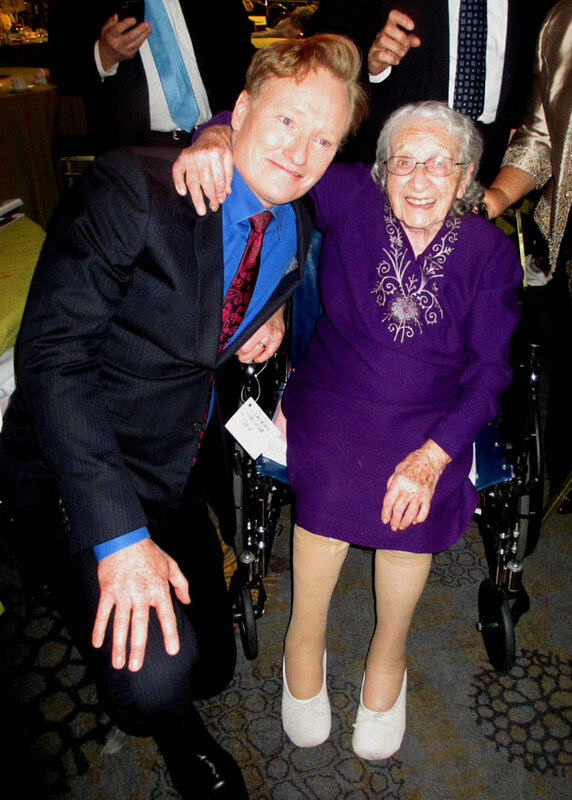 Executive Director Stephen Smith specifically mentioned Grandma by name from the podium to all the guests (including Obama) as a 100 year-old survivor of the Armenian Genocide and as the most recently documented Shoah interviewee. Grandma seemed to enjoy every minute of the evening…people watching, speaking with those who approached her and posing for pictures. Grandma’s favorite lines of the night were: “God Bless you ALL,” “His Kingdom is Near,” “I love Jesus,” and “I love and forgive the Turks”. With a sparkle in her eye and a continual smile on her face, Grandma took it all in and, might I add, for a rare moment, enjoyed the attention. Seated next to Kim, I was able to speak with her as we ate dinner. We spoke of her heritage, her trip to Haiti, American materialism, motherhood and fame, the story of Grandma’s dress, the plight of Armenia and the work my parents do there. She said she has not been to Armenia but is excited to visit one day. Grandma held up well during the long evening, enamored and fueled by the magical world she had briefly stepped into. Even on the way out, we were stopped several times by those wanting to speak and take pictures with Grandma. The VIP treatment continued as the valet rushed to get our vehicle ahead of all the others waiting. All in all, it was a lovely evening, thanks to our gracious Shoah hosts, Derik and Maggie from Ararat Home, Grandma for taking me as her date, and my dear sister Searan Kiledjian, for insisting I go in her place. Oh, and one more resemblance between Cinderalla’s story and Grandma’s that I forgot to mention: they were both wearing slippers to the ball…although Grandma took both of hers back home.